really? People would actually use this? I mean maybe the Dad... like when he's driving Mom up a wall and she says "here! take this and time contractions....waaaaaay over there on the other side of the room!" Nothing snide, I just don't get it. But hey, to each their own. My way isn't the only way. Thanks! I am going to recommend this to my Childbirth Ed students. Any other recs? This seems like a great app! Since I am 10 weeks pregnant, this will be a very handy one to utilize! I was going to look for a contraction timer--this has one. Everything else will be a great bonus for my second vba2c! Sounds fabulous! 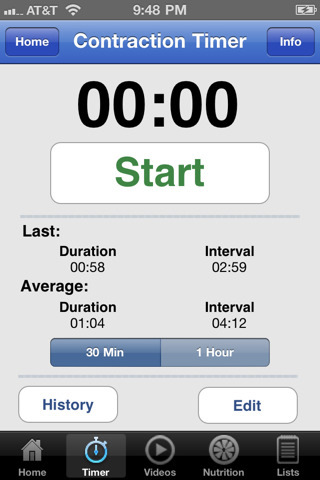 I WISH I had an apple device - I would buy the app just for the contraction timer. The video library sounds like a great way to expand my repertoire of labor positions beyond what I'm familiar with. I'd love the DVD. I used an online contraction timer when I was in early labor in August, and it drove me nuts. Kinda like a watched uterus never contracts. Ooo. I'd like to win the birth video. I'm planning my first home birth and trying to find good birth videos to give my family and idea of what to expect. Ooh how wonderful. I love the videos! This is so helpful as a new doula. I would love to win the app since I could easily use this during my prenatals! I love the techniques for dealing with back labor! The contraction timer looks snazzy, too. I just got an iPhone 4S so I'd love the chance to win a free download! This is AWESOME! The best feature has got to be the videos...those would/could come in so SO helpful during my upcoming birth...keep me in check. The app would work for us. will surely share on FB! I'd love the app. I'm planning a home water birth for Dec as I physically can't have an epidural/spinal (not that I would want one) and have started doing as much research as possible. I would love to have those videos - I had terrible back labor with my son and trying to remember which positions were for what was a hassle. This looks great! I'd love to use the video in my CBE classes to help demonstrate labor positions before practicing them. I'd love to utilize the birth positions videos, especially before labor begins, maybe my body will build up some muscle memory so it becomes second nature to find the right position for that particular point in labor! I have an iPhone, so I'd pick the app.